Duepner Law provides top notch legal services at affordable rates. We are a full service Hamilton County law firm but represent clients all across the great state of Indiana. Our office is centrally located in Hamilton Country in the city of Noblesville, just north of Indianapolis. Our clients consist of large corporations, business startups, and individuals on multiple issues ranging from Personal injury, Estate Planning, criminal defense, divorce, expungements, real estate, and overall litigation. At Duepner Law, we pride ourselves on providing dependable, fair and knowledgeable advice to our clients. Contact a Hamilton County Attorney today. 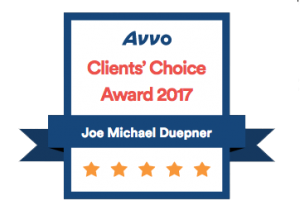 Joe Duepner stays up to date on changes to the laws and utilizes the best strategies for his clients. His pricing is fair and he will be upfront with what you can expect from him. I have used him several times personally, referred close friends of mine and will continue to highly recommend his services in the future. Joe was extremely professional throughout my experience with him. He delivered exactly what he set out to accomplish with my case in a timely and efficient manner. I would recommend his services to my all friends and family around the Hamilton County area. Joe has been the best attorney I have worked with. He was there until the end and never stopped until we won our case. His prices are affordable and fair. I will use him in the future if needed. great choice for legal counsel. very fair pricing and compassionate with his clients. he is very prompt with getting information and paperwork done. i highly recommend him.